Versatile pant that’s geared for cragging but transitions easily to off rock activities in town. Made of a midweight, hardwearing 6.5 oz. cotton/nylon canvas fabric, the Bastion Pant blends natural fibre comfort with extended durability. The relaxed fit with traditional work pant styling travels anywhere. The Arc’teryx attention to intelligent ergonomic design is evident. Articulated patterning combines with gusseted construction for maximum freedom of movement. Features include an easily accessible leg pocket that holds a smartphone or media device, and riveted stress points. * Cotton Nylon Canvas 6.5 oz/yd² (233 g/m²). A burly, mid-weight Oxford weave textile with a smooth hand that is constructed with a blend of cotton and nylon for comfort and durability. Bastion Pants, 30" Inseam - Mens is rated 4.4 out of 5 by 8. Rated 4 out of 5 by pdmwithfriends from Awesome in the Heat I bought these in the USA and very shortly after moved to South India. In the Summer. Temperatures here reach in excess of 40 degrees Celsius. I have to say these pants are probably the most comfortable pants I have ever owned! I'm really particular on the kind of trousers I wear, and these justify the cost. They are comfortable in muggy hot environments. The fabric is thin and probably best suited to warmer climates. They are lightweight which is ideal for a day in the office or out and about in the field. They are spacious and fit comfortably. The length is generous and as with most American bought trousers I have to have them taken up and hemmed. I would recommend them for comfort in the field on a hot day. Rated 5 out of 5 by Labrador72 from My Favorite Pants Extremely comfortable pair pants with a very nice straight-leg relaxed cut. They are very comfortable for a number of activities and even if not a technical piece of clothing, they can be used for climbing or easy hikes in warm weather conditions. Even if the gusseted crotch and articulated knees allow moving freely, I'd still like to see a small amount of elasten added to the excellent cotton-nylon blend for extra stretch and so that the pants keep their shape even if wet or after a couple of days of use. Hoping to see them in Admiral 2016. Overall I can highly recommend these pants. Rated 5 out of 5 by LamboRambo from The best pants for any outdoor activity. These are my favorite pants because they are comfortable, very durable, and temperature regulated. I have used them while hiking, mountain biking, climbing, and around town. The fabric is really great because it is soft, durable, cool in the summer, but also warm in the southwest winters. I like them so much that I bought a second pair. You get what you pay for with these pants. Rated 4 out of 5 by Enrique from Improper Pantsing - but still delivers Love the material, love the feel, love the features of these pants. Relatively thin and breathable in the heat. Comfy hand. Unfortunately, there's seems to be 2 types of Arcteryx pants, those that fit great, and those that have a mysteriously constricted pelvic envelopment. These unfortunately fall in the latter category, so I had to size up to a 32 waist, which is slightly loose and I definitely need a belt. Other Arc' models like the Rampart and Gamma LT fit great in 30 (also their ski pants in small like the Stingray). But the Bastion, Palisades, Perimeters, and Stowe are all either too lose or too tight, not just right. Both of those groups contain both Relaxed and Athletic fit, so that doesn't explain it. (Rampart and Bastion are both Relaxed.) They are also slightly longer than the other pants, but this seems true to size. Pants like the Rampart fit me well in 32 inseam (Arc's regular pant length), even though my inseam is 30. These seem longer in 32, they drag in bare feet, which works in this casual pant. So in length they appear more accurate. Perhaps I have unusual proportions. Otherwise, they feel great. Rated 5 out of 5 by Volition from Great All-Rounder Ordered 28-30, the waist is a little large even at 28, but it's very comfortable. The articulated knees and gusseted crotch work really work for even climbing when making some high steps. I liked these enough to purchase them both in Graphite and Peat and both are simple and stylish. Rated 5 out of 5 by RedNeck from My favorite pants Have to say these were my first from Arxteryx and they quickly became my favorite. Great fit, wear well and nice and light... over all very impressed with the fit and feel. great for work or play! Rated 5 out of 5 by Murch from My favourite pants These pants wear well, and fit me great. I have relatively large legs and there is sufficient room in the legs of the pants to provide good mobility for outdoor activities. 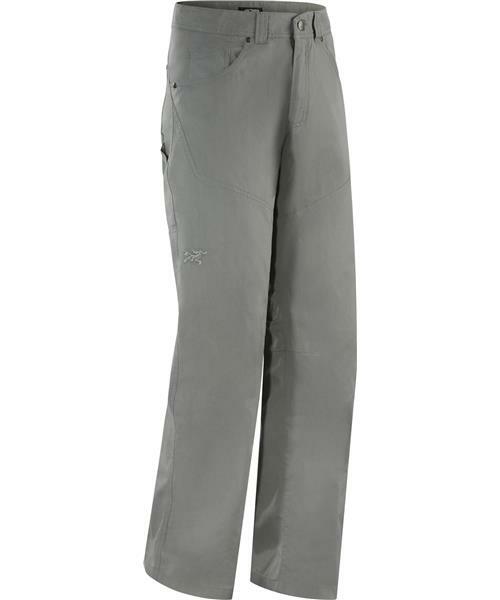 I will continue to buy these pants as long as arcteryx makes them.